Is There a Way to Customize the Email for a Certain Prospect? While you can customize your emails in bulk using universal variables (both default and custom), you can also tailor literally each copy. 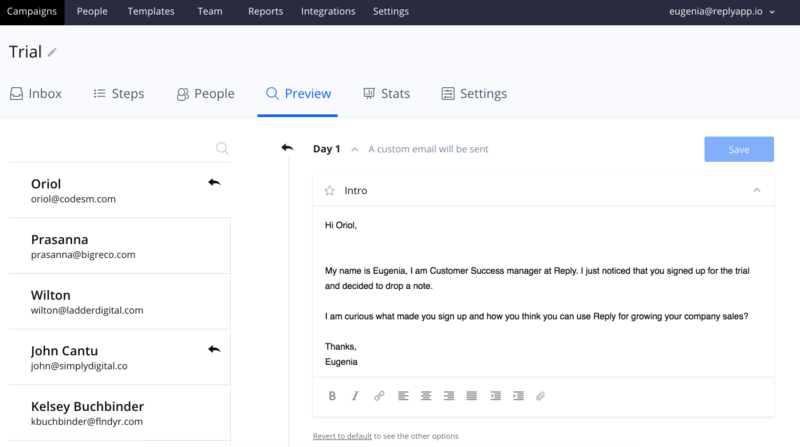 To customize the email for an individual prospect, please go to the Campaigns Page -> select the Preview tab -> select the intended prospect -> and customize any step you want to change. This won't affect the primary campaign's template. The only information you cannot alter on this page is variables. Because Reply populates variables with information taken directly from the contact, any attempted changes will revert.